The following interview was conducted with the curator Shan Bryan-Hanson about my upcoming exhibition Brandon Bauer: Works In Progress 1996-2012. 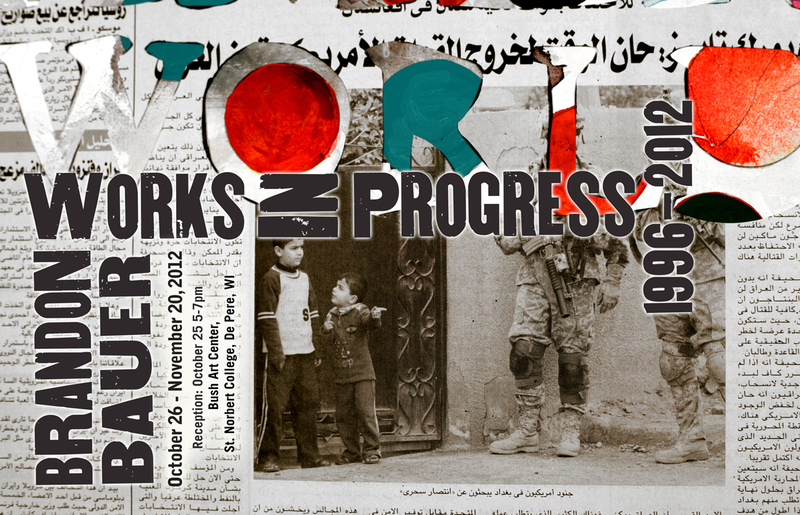 The exhibition will be held in the Bush Art Center Galleries at St. Norbert College From October 26th through November 20th 2012, and the opening reception will be October 25th from 5-7pm. Shan Bryan-Hanson: When we discussed possible exhibition dates you were very interested in timing this exhibition with the Presidential election. How does your work engage with politics? Is it political? Brandon Bauer: My work has consistently engaged with social and political issues from the beginning. Sometimes this has manifested itself in very pointed and specific ways, and other times in more reflective or ambiguous ways. Given the topical nature of my work I thought the political spectacle of the election would be an interesting backdrop for this exhibition. Shan: How does your work fit into the notion of art as activism? Brandon: I have never considered myself an activist, but I do feel art has a responsibility to engage with the most pressing issues of our time. I am intrigued by the space art creates for social, cultural, and political critique and the contemporary and historical roles of such perspectives. In many ways the issue of art as activism comes down to the question of the critical distance or the critical proximity one takes to any particular issue. Shan: There are many drawings, and even a few paintings, exhibited in this show. What role does drawing play in your work? Are there similarities in the way you approach your drawings and digital work or do you view them as entirely different means of expression? Brandon: I enjoy the process of manipulating material to create. I employ methods often referred to as traditional such as painting, drawing, and printmaking, as well as installation, photography, video, broadcast television, and web-based works. In many ways there is no difference in the way I approach these various methods, but there is a difference in how works are received. I tend to approach ideas through multiple methodologies and assess the effect on content. Recently I have been concentrating primarily on drawing, photography, and video. I like that all three of these approaches are open ended and flexible. The quality of the human touch in drawing, the immediacy of the photographic image, and the sequential and durational nature of video all have the potential to provide distinct effects with the content I am addressing. Shan: Define “New Media”, as you see it. The term can seem a bit nebulous since digital technologies are constantly evolving. Brandon: Honestly, I have a lot of conflicting feelings about the term. On one hand, it is really too vague to have any meaning, and the emphasis on “new” seems to be from another era more concerned with breaks and ruptures, and specific divisions like old and new, rather than how ideas and forms evolve and continue in altered configurations over time. However, I do appreciate that it is not a static term and is really a moving target one can never catch up with; for example, methods that were new in the 1960s when the term was first adopted are no longer new. In that sense it is an appropriate label in that it speaks to the continued development of art in relation to technology, and how artists continue to adapt, create, and critique new technological forms as they continue to emerge. On the other hand, digital technologies are so embedded in our culture now, even artists using explicitly traditional means employ digital technologies as forums for discussion, research, or utilize networks to share their works possibly indicating that “New Media” as a descriptive term creates more problems than it solves. Perhaps it is time to be more specific about the possible forms art can take and the continued evolution of these forms rather than setting up a contentious dichotomy between old and new with the use of such terms. Shan: Would you address the use of text and appropriated imagery in your work? I’m thinking about your recent fashion drawings and the collage images from the mid-2000s. The juxtaposition of the fashion images and your choice of text is very compelling and really speaks to the strange barrage of images and ideas we’ve come to view as normal; an advertisement for designer shoes on the same page as a news story about war and human suffering, for instance. Brandon: In many ways that is a project I have been developing for a long time in multiple ways over several series of work. At heart I am a collage artist, even if it is through other means that do not directly read as collage. Collage is about bringing distinct fragments together in a shared context. The two series you refer to are both about bringing together distinct spheres of mediated language and the worlds they represent, such as the language of the advertising image and the language of the news headline. In all of my work I am looking for specific tensions or frictions between the elements I combine often using strategies of collage and montage to create new meaning from existing materials. I want to create awareness of the normalized barrage present in mass media that appears largely unexamined in society. I feel it is often the things that are taken for granted or overlooked that need the most scrutiny. Monday – Friday 9 a.m. to 4 p.m. during the academic year. Closed summer and College holidays.